I just completed a 10K race this weekend and I’m still riding off the high of setting a new personal record; I shaved off 5:16 from my previous 10K time. This race was with the Brazen Racing group, which have become my favorite group to run and not just because they give out It’s-Its after every race. I promise I was not excited because I was seconds away from getting an It’s-It. While I was running, I couldn’t help but reflect on why I love running so much. This is such an interesting sport with people on every level competing together (and not against each other). There were people of every shape, size, and ability level but there we were, all huffing and puffing towards the same goal of finishing. Finishing was the only thing that mattered. It didn’t matter if we ran the whole time or crawled over the finish line; we all worked hard and finished. I liked seeing the camaraderie on the course; strangers cheering each other on, high fiving each other and passing on words of encouragement. Anything and everything to keep our spirits up and focused. Yes, it’s hard to see people heading back to the finish before I even make it to the halfway point and I’m in awe of people who finish half marathons in the time it takes me to finish a 10K but instead of being discouraged by these people, I’m encouraged because they were once where I am. No one is born running; even the most decorated runners had people outrunning them at some point. But they kept at it and, if I’m being honest, while I’m busy admiring them, someone down the line is admiring me. That is quite a humbling idea. While I love running for a myriad of reasons like: having time to think or not think, competing against myself, having some me time, staying healthy and fit, what I really love about competitive running is the communal spirit. While we’re doing this individually, we’re still doing this together. That strangers encourage and congratulate others because we all know and understand the struggle that is running and the joy of triumphing over it. You guys: I did it. I survived the Healdsburg Wine Country Half Marathon. And when I say ‘survived,’ I really, really mean SURVIVED because it was a battle of wills. As I said before, I didn’t really train as much as I should have. This wasn’t the distance where I could mess around and expect to do well like I did for my last 5k, but yet I allowed myself to be talked out of running at every turn. That was a huge mistake. I was arrogant and stupid and grossly overestimated my ability to run 13.1 miles for the first time ever. I was a bundle of nerves but ready or not, I was going to run. The race started fairly well. My whole plan was to alternate between running and walking (this helped to inflate my ego and confidence in my ability to finish this race without much issue. I’m trying not to smirk as I write this.) and because I’m a genius, I didn’t have anything to actually time myself to make sure I stayed on a 2 min run/1 min walk pace. I ended up running until I needed to walk, which worked for a while but I ended up running out of steam a lot sooner than I probably would have had I regulated myself. I started touching the mile markers at 7 miles because I had never ran that far before and it seemed appropriate. Things were going well until around the 9 mile mark and then I hit the wall at mile 10. I could barely convince myself to move and ended up walking most of the last 3 miles, which was kind of disappointing. I thought about quitting several times during the race but when I touched that 13 mile marker I was proud that I kept going through the sore muscles, blistered toes, and a slightly wounded ego. 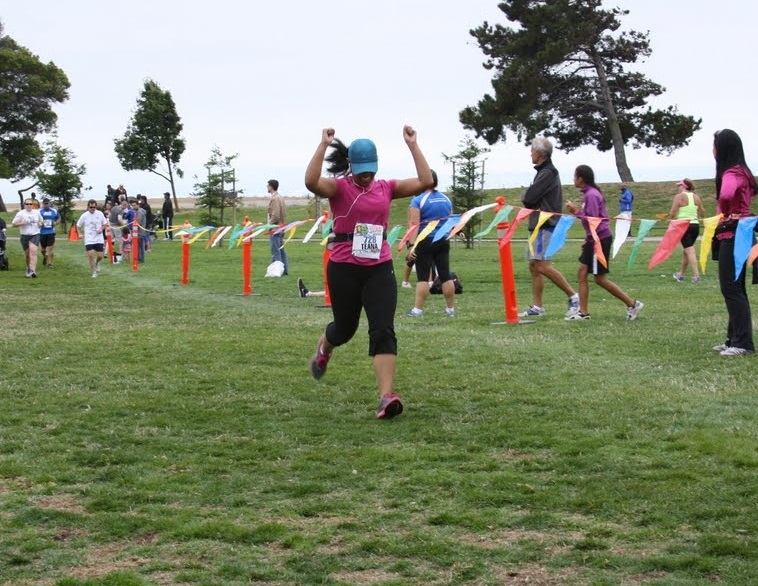 I did end up running across the finish line (even though the pictures make it look like I just walked) and my final time was 3:10:31. While I hoped to finish under 3 hours, I’m happy to have finished at all. Sure I could barely move and had to shuffle but I conquered 13.1 miles and had the medal to prove it. I wore that medal all day. Looked great while shopping for snacks at the gas station on my drive home. Would I do this again? Abso-freaking-lutely! I’m already looking for my next half and I’m sure I’ll sign up for the Healdsburg race again next year. Would I do a full marathon? Right now I say no knowing full well that I could change my mind later on (remember when I said I wasn’t going back to school?). Let’s just say I’m keeping my options open. I can do that. I ran a half marathon.